The Adventure Club teaches outdoor skills in a fun yet challenging way to kids ages 7 and up. Ranging from building shelters to making fire, learning how to navigate to staying safe in the outdoors, the Club also links strongly to the Scottish Curriculum for Excellence, particularly in developing maths and science skills. Learn the ancient skill of making fire easily and safely and leave with the blissful confidence firemaking brings. In the morning session we will work with a bow drill and flint and steel to make fire by friction. Find out why this ancient practice is an important skill even in the modern day. For the afternoon session, we’ll build a campfire! Learn how to make the perfect campfire depending on your needs — from warming yourself to preparing a drink to cooking food. We don’t just use our eyes and ears to learn the ancient skills or to experience the landscape, we immerse ourself in it and discover through tasting, feeling and smelling too – if you can. By enlisting all the power of your senses, you learn deeply and gain a profound connection with nature, the history of human fire making and thus your entire world. 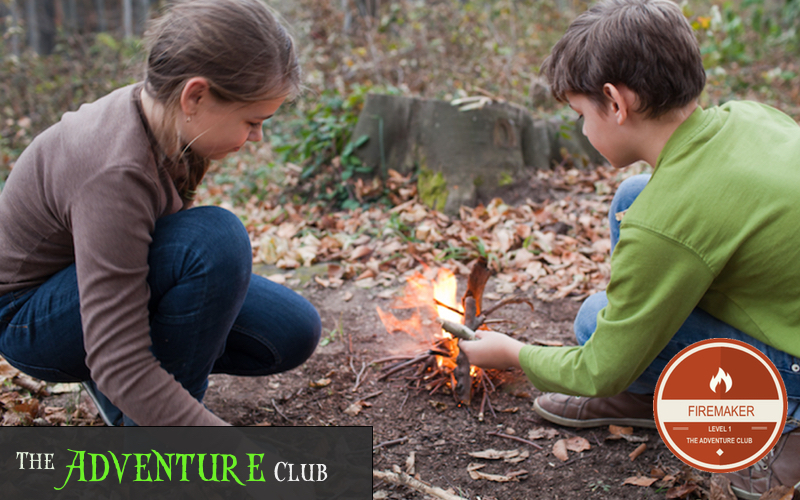 Earn your Adventure Club Level 1 Firemaking badge upon completing this session! Learn more about The Adventure Club or Buy Tickets below.